The Rust Restoration Specialist ! Sheet metal fabrication is the act of forming, shaping, and joining metal together to build and or repair a tangible part. There are many techniques and tools. It’s been done since the beginning of time when even the simplest tools were used. In this article we will share the most common and important tools, machines, and techniques for the DIY fabricator. Metal Shaping or forming can only change metal in four ways. You can bend, cut, shrink and stretch metal to form it. Below are the common tools and techniques to perform these tasks. Form Bending- This is the simplest way to bend metal. In this method you are bending the metal over an edge or shape that is located under the metal. For instance you can push a flat piece of metal over the edge of a table (with your hands) to make a bend. You could also use a hammer and shaping dolly to bend the metal around the shape that is desired. Metal Brake- A metal brake is the most common way to make clean, precise bends in metal. A metal brake works by placing the metal on a flat, gated surface and then clamping a flat bar on top of the metal and lifting the gated portion to bend the metal to the desired angle. Most metal brakes can make bends to just over 90 degrees. We offer a selection of diverse sheet metal brakes on our site. Hand Shears- Using hand shears or “aviation snips” is a manual, way to cut metal that’s necessary no matter how many large tools you have. Snips or hand shears are one of the first tools you should purchase when entering the world of metal fabrication. We offer a full line of Hand Shears and Aviation Snips that range from the simple straight, left and right snips to specialized jaws. Power Shears- Power shears are best described as power “scissors” for cutting metal. 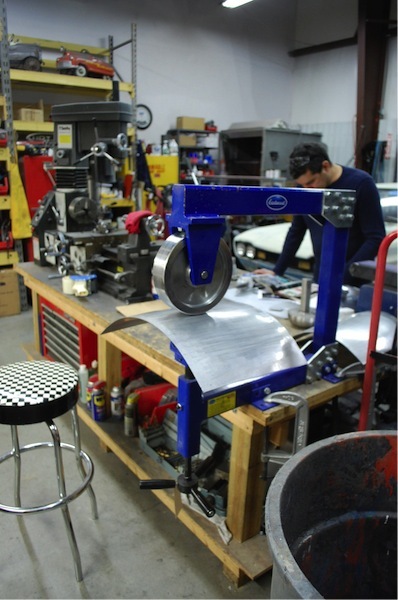 They allow you to cut sheet metal more quickly and with less manual effort. There are many different types of power shears ranging from pneumatic shears and electric shears. Most power shears aren’t able to cut intricate shapes or tight corners. Some specialized throatless power shears or “nibblers” on the market can cut tighter radii. Most power shears do waste some material when cutting (determined by the spacing of the stationary jaws). We offer both pneumatic and electric power shears at affordable prices. Throatless Shears- This is another type of mechanical cutting or “shearing” of metal. They’re often times described by a well-known style of these shears called the “Beverly Shear”. These are designed to allow you to cut metal in straight lines or shapes and radii in sheet metal with no marring of the cut edge. They are hand operated and use a hinged blade that swings down and cuts the metal that’s lying on a stationary adjacent blade. Throatless shears waste no material when cutting. These are a must have for anyone making more than a few cuts in steel. This should be your first big cutting tool purchase! We offer a bench mounted economy throatless shear that can cut up to 14 gauge mild steel. Angle Grinder- I am a firm believer that if you plan on working on anything made of metal, you need to own an electric angle grinder. These suckers are the workhorses of most shops. They simply spin the attached disc or wheel at a fast rate of speed for removing material in a quick manner. Thin cutting discs are available for cutting metal. These are noisy and messy, but they will get the job done. This is my choice if I need to cut through multiple layers of sheet metal. I prefer to have two of these on hand, one with a flap or sanding disc and one with a cutting wheel to avoid having to save time. We offer a few different selections of angle grinders that are eager to be star players in your shop. Plasma Cutter- Plasma cutting can be as aggressive and powerful or delicate as you want if setup properly. A properly adjusted plasma cutter can cut sheet metal quickly with extreme accuracy and minimal clean up. These are extremely helpful if you need to make long straight cuts that may be difficult to handle alone on a throatless shear. 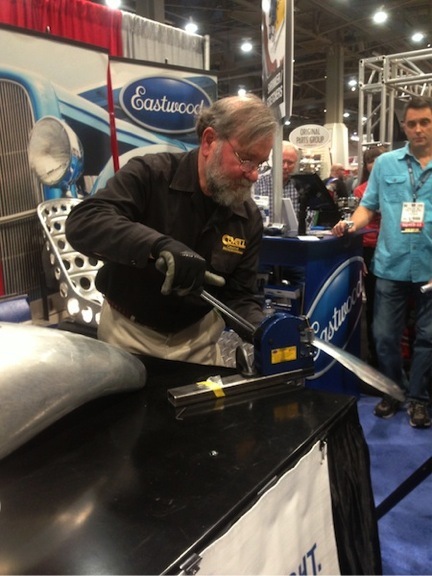 Eastwood Company offers plasma cutters that allow you to cut paper thin sheet metal all the way up to ¾” steel. Tucking Metal- Tucking metal is one of the earliest methods of shrinking metal. In this method you’re literally bunching the metal together by forcing it between a crevice with a spade hammer or by folding the metal over at the edges with a homemade tucking fork. This method is one that has been used to form some of the earliest most valuable sports cars. A good hammer and a wooden stump with cleverly placed cuts and crevices formed can work wonders! Shrinker- A shrinker is a lever-operated tool (hand or foot) that has moving textured jaws that grasp sheet metal from the top and the bottom and force it together tightly. This method is much more precise than tucking with a hammer and form, but moves the metal much slower. You can carefully work particular areas to shrink them as desired. The shrinker leaves minimal marring on the metal, most of which can be removed or smoothed out with a sanding disc or file. Heat Shrinking- This is a method that takes a lot of practice. The basic idea is that you heat a overstretched area (with a torch) almost red hot and then as the area cools it shrinks. The type or amount of stretched metal or damage will determine how you shrink or smooth the area out. You may need to hammer and dolly the area or quench the area with a wet rag or compressed air to get the desired shrink. Alternatively there are shrinking discs on the market that are attached to an angle grinder that use friction to create the heat. These are a bit more precise and avoid using a torch/flame to heat and shrink the metal. Hammer and Dolly- This is the most basic way to stretch metal. With this method you firmly hold an object behind the metal and hit the other side with a hammer. This forces the metal to be compressed and ultimately stretch. Metal can also be stretched in a similar method by using a sandbag and plastic mallets to quickly stretch metal and make shapes. Stretcher- The opposite of the shrinker mentioned above. This is a mechanically operated tool that puts the metal between two flat textured jaws and pulls the metal apart slowly each time the lever or foot pedal is pressed. 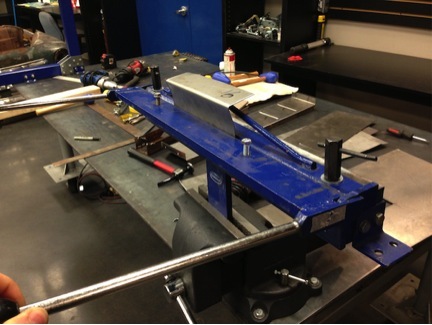 The shrinker and stretcher together are must have items for anyone doing sheet metal fabrication. English Wheel- This method works in a similar fashion to using a hammer and dolly or anvil to stretch the metal out. The metal is placed between a large, flat-faced upper wheel and a lower “anvil” that has a radius to the face. The lower wheel is then screwed up to pinch the metal between the two wheels and the metal is rolled back and forth slowly stretching the flat metal over the curved lower wheel. This method stretches the panel to create a uniform crown. You can also use the English Wheel to smooth out imperfections in the metal caused by using a plastic mallet and sandbag as described above. We offer a couple DIY English Wheel options that can handle most panel shaping needed. 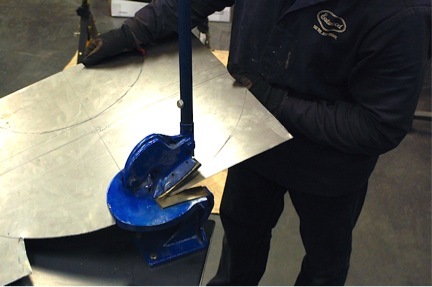 The last important method of sheet metal fabrication is fusing small panels together to produce larger complex parts. The most common type of metal fusion is welding. The most common methods of welding during sheet metal fabrication are listed below. Oxy Acetylene Welding - This type of welding is the oldest method, but it’s still used by many today. 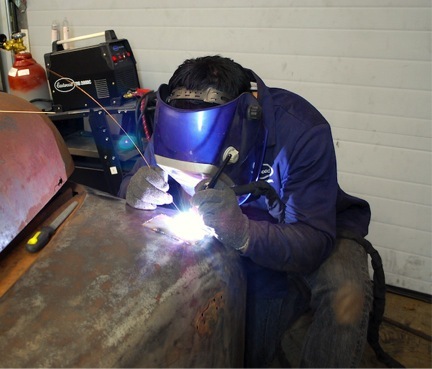 Oxy Acetylene welding uses tanks of Oxygen and Acetylene that are mixed together with an adjustable torch to create a precise, controlled flame that a piece of metal can be heated with. While heating the base metal you add a filler rod that joins the metal together. This method does take a lot of practice to master, but the welds produced are the softest and most pliable. Oxy Acetylene welds are the easiest to planish (smooth out) with a hammer and dolly to get the weld joint as flat as possible. TIG WELDING- This type of welding is the most desired by professionals in the sheet metal fabrication industry. It uses a “torch” that has a non-consumable electrode that creates a small, precise electric arc that melts the base metal. You can then join the metal together by adding filler rod to the puddle of molten metal with your other hand. TIG welds are the second softest weld but are the most difficult to master. TIG welding is more precise than Oxy Acetylene welding and most modern fabricators prefer it. Eastwood offers a full line of TIG Welders and TIG Welding Supplies that will round out your sheet metal fabrication tools. MIG Welding- A MIG welder is the most common and probably the easiest form of welding to learn. This method uses a motor to feed the filler wire through the tip of the MIG gun. The wire then completes the circuit when it touches the base metal and melts the wire into the weld joint, fusing the metal together. MIG welding creates sparks and requires more cleanup than the other methods above. It’s also the hardest weld, so it’s harder to grind and hammer flat. Most beginners and DIY guys prefer this method because it’s quicker and easier to master. Eastwood offers MIG welders that can weld sheet metal with ease and also diverse enough to perform heavier fabrication. By following the basic methods and using the tools mentioned above you can tackle most any job you come across. The most important thing to remember is that you need to learn to watch the metal and learn to read what needs to be done to get it to where you want. So get out there and practice! Cut, bend, shrink, and stretch to make your dreams become reality in metal!